A large percentage of women come through my class who arrive with one of two guns, usually that someone bought for them. The first is a .38 snubbie and the second is a .380 mouse gun. Both types are extremely popular among women, especially those women who are new to shooting. We know that while the .38 snubbies, double-single action or double only, are powerful little guns, they are also difficult for smaller hands to shoot. With practice, a small .38 special can be a fine carry option for anyone. But, how about the .380? There are plenty of options that have surfaced in the last year or so, making for a wider variety of sizes and shapes of .380 pistols. So, how does the .380 stack up to some of the more powerful rounds? First off, the .380 ACP is closely related in size and shape to the 9mm. The bullet circumference is essentially the same, but the bullet height and shell casing is shorter. Therefore, it’s less powerful than the 9mm. Does this make the .380 a good defensive round? I recently did a video on our channel about how it stacked up to a .22lr, 9mm and .45acp. Ok, it wasn’t the most scientific test ever put on the internet. It did, however, show just what each round was capable of in terms of sheer penetration power. If you are in a close quarters confrontation, let’s say within 6 feet of your attacker, a .380 will certainly punch a hole through clothing and do damage to an attacker. I mean, we shot it through a laptop and through the majority of a hardbound book that was over 1000 pages, and did so from roughly 15 feet away. I’m not sure how you feel, but I can tell you that I certainly wouldn’t want to be hit with that round. Will it do the exact amount of damage a 9mm, .40 or .45 ACP? Not likely. The 9mm sailed right through the book and made confetti out of the latter pages. But .380 proved that it will do serious damage if needed. I mean honestly, even a .22lr is a round I don’t want to experience from the muzzle end. 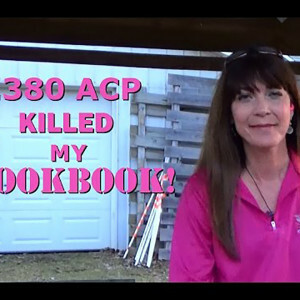 Am I suggesting that you should carry a .380 as your first choice? For most people, no, I’m not. Sure, it’s a round that certainly works, but it’s by no means at the head of the class for something I would bank my life on in a critical situation. I’m perfectly comfortable with carrying my 9mm or very often a .45 ACP. They are rounds that I shoot frequently, so the notion of carrying a bigger round doesn’t make me skittish. It makes perfect sense for me to carry the biggest round that I’m comfortable with. That’s really the point, isn’t it? Carry the biggest gun you can handle and conceal comfortably. If you’re not comfortable with your choice of gun, then you might be inclined to avoid carrying it at all. The takeaway for me is, having a concealed firearm, even a mouse gun, gives you a better chance at surviving a critical situation than carrying nothing at all. 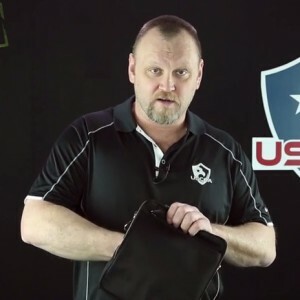 USCCA discusses the importance of proper off-body carry for women. Securing your firearm properly is the most important thing that you can do.